Looks like I've fallen prey to the nasty virus that almost took the husband out. Last night I felt really bad and I coughed up several lungs until I remembered, aha I have a bottle of prescription cough syrup leftover from a year or more ago. Might it still work? Worth a try. Sweet relief, codeine is so good to stop a cough and put me to sleep. Apparently being somewhat past date did not effect stuff from doing it's job. Got up at the usual time and felt seriously weird, head all stuffy and buzzy, more coughing, but no fever. Yeah! Went back to sleep and woke up at 11 feeling almost, but not quite, human again. Ate a bit, felt even better though my chest is raw and I'm still coughing I'm doing pretty darned good. Well, except for my back. Tuesday I put the bedroom back together, the one where the kids had been sleeping. Decided to move the bookcase the husband made back their and he and I proceeded to move it from the front of the house to the back. Bad decision. We were doing well until we had to turn a corner and it was easy to hold onto the front, but the back not so much. He instructed me to press my hand to the back and lift. What? Like I have enough strength to do that. I gave it my best and only asked that we set it down once, but I have now whacked out my back and even if I wasn't ailing would be grounded. So maybe I can get it all over at once, sit around, read, watch movies and heal up. Certainly it's looking as if I'll never learn that I'm not 30 or even 40 anymore, that I can no longer lift heavy things nor move furniture. The husband is now feeling much better and he planted chard, kale, mustard, and beets today. Rain is in the forecast for the next few days, 90% chance one day so I am hopeful that it will actually show up. Checked on the radishes and many of them have just shriveled up, but have plenty of seed so replanting is in order. The peas are coming up in spite of the arid conditions. I am excited about their appearance. It's an incredibly beautiful spring day. The breeze is soft against my cheek and sun is warm and golden. 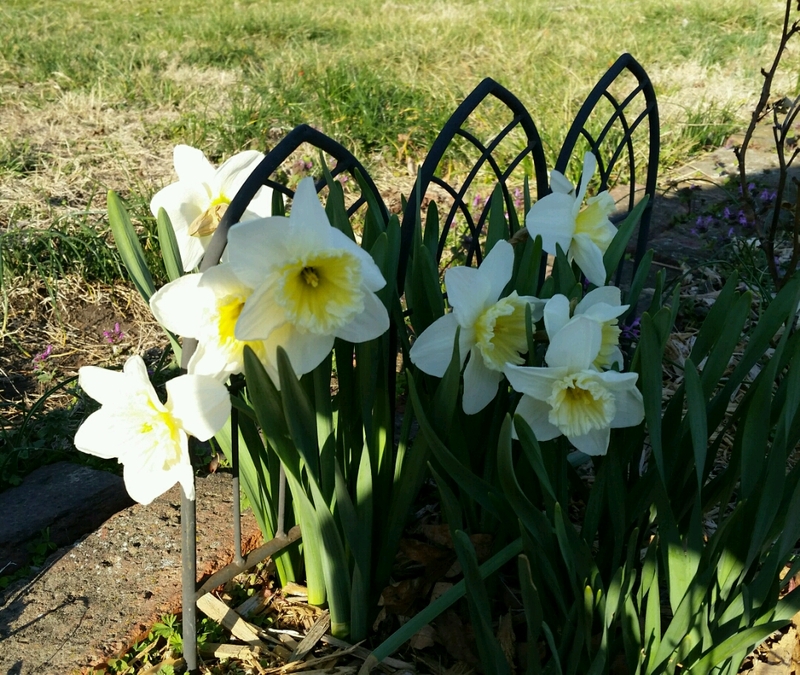 The wind chimes are singing along with the birds and the daffodils are lifting their heads to the sky. How can I not smile? Hope the cough is short-lived. That would be brutal with a sore back on top of it! The flowers are lovely. Glad you are having a taste of lovely spring weather. There's nothing better! It's hard admitting to yourself that you are getting older. I'm flirting with 60 and keep thinking, "But I used to do this all the time!" Sigh... I'm right there with you. Accepting the aging process has been so challenging as I've never been one to sit around. Each decade offers further decline ... sigh. I think viruses may one day rule this planet, they have a million tricks up their sleeves. As my Da used to say, growing old isn't fun, but it beats the alternative. He was a stone cutter and lived until 80 on a quarter of a lung. I like to think I come from hardy stock. :D It would be much improved with the back injury, but it is what it is. I suspect you are right about the virus - them and cockroaches. They are set to survive anything.